Let’s be honest here: we’ve all planned the perfect heist, right? We’ve all, in our mind, handpicked the perfect criminals to accompany us on a daring raid of some bank or government building or other, detailing exactly who performs what role and where everyone should be at any given time. There’s no need to feel guilty; it’s cathartic, and besides, it’s great fun to put your friends in those positions. Which of your circle would be your getaway driver? Who’s on safe-cracking duty? If it’s a more modern job, who’s the computer ace? Of course, there’s also a chance the whole thing could go sour. Double-crossing and backstabbing are par for the course in the world of crime, and people you thought you could trust might turn out to be your worst enemies. What should have been a leisurely stroll to the getaway vehicle ends up becoming a fight to the death as you battle with your friends to be the first (and probably last) to escape the increasingly chaotic scene of the crime. Thanks to Minnesota-based New Eich Games, you can experience exactly what the perfect heist gone wrong with your friends would feel like. Their latest game, Getaway Shootout, takes place during the ultimate heist gone wrong, with four would-be criminals racing to the escape vehicle and leaving their erstwhile friends behind in the process. 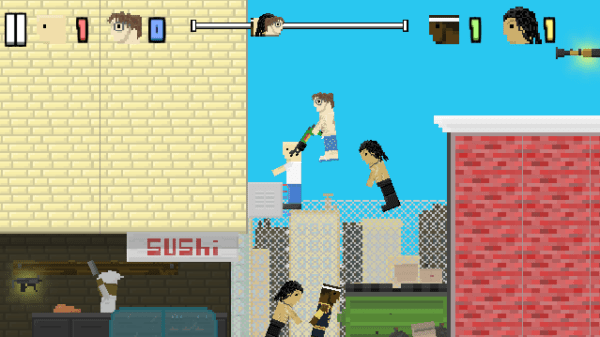 If that description alone has sold it to you, then you can play this game on Poki right now. 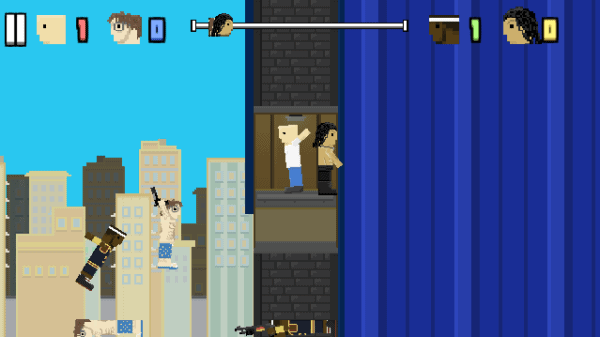 New Eich Games’ previous titles include Rooftop Snipers and Ping Pong Chaos, so if you’ve played either of those then you’ve got a pretty good idea of how Getaway Shootout will play. If not, here’s a crash course (and we use the term “crash” advisedly). 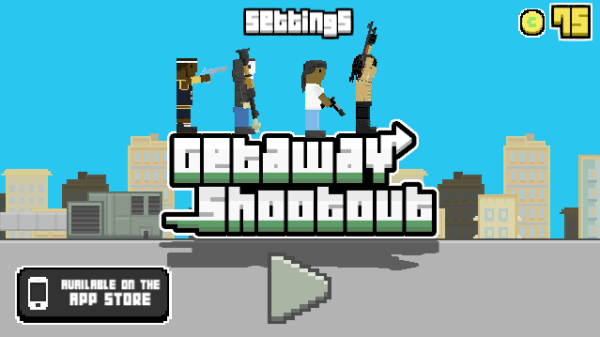 Getaway Shootout casts players in the role of one of four interchangeable criminals who are racing each other to reach a getaway vehicle. Sometimes that vehicle is a truck, sometimes it’s a helicopter, and which vehicle it is can affect gameplay (which we’ll get into later). Along the way, these four hapless individuals will find weapons and tools to help them get ahead, each of which can be used to either slow down their opponents or help them in some way. You will need those tools, too, because the controls are the first major obstacle to Getaway Shootout. We don’t say that as a bad thing; the game’s control scheme is idiosyncratic and unique, especially if you aren’t familiar with New Eich’s other work. Essentially, you have two movement keys at your disposal: W and E for the first player, and I and O for the second (if you’re in two-player mode). W jumps left, and E jumps right. How long the key is held down determines the length and velocity of the jump, so a quick tap will send you upwards slowly while a long press will see you rocket in whichever direction you’ve pressed. Holding the key for too long will cause you to falter, so you need to be decisive but strategic in your movement. This system definitely takes some getting used to. Don’t be surprised if you spring headfirst into certain doom a few times while you get acclimated to the controls. If you’re in single-player mode, the game’s AI isn’t pulling any punches, so you’ll probably lose your first few games. Once you’ve got a handle on the movement, though, there’s a surprising amount of depth and complexity to Getaway Shootout’s control scheme. Jumping around quickly feels natural and intuitive (believe it or not), and it’s a compelling and innovative way to move a character, so you’ll be quick to master the controls once you’ve got a basic grasp. Most importantly, it looks and feels hilarious, with close calls quickly turning into festivals of collision with other players as everyone tries to leap forward and gets stopped by other players. That control mastery will come in handy, because Getaway Shootout is a violent frag-fest at its core. You’ll need to keep an extremely close eye on your enemies while you leap towards the exit, because they’ll be picking up weapons and powerups just like you, and they aren’t afraid to use them. Powerups include pistols, rifles and bombs on the offensive side, and shields on the defensive side, among various others. If an enemy gets their hands on a weapon, you’d better seek cover, preferably behind another player. This does unfortunately mean that some matches are nowhere near close calls, as a well-timed jump by an enemy means they can get their hands on a weapon early and skyrocket ahead of everyone else, so that particular match isn’t a competition. Getaway Shootout doesn’t pull its punches, so once the match is over, it’s over; don’t expect any contrition from your enemies. That’s not really a problem, though. Getaway Shootout demands mastery from its players, and it won’t let you win until you have it. It’s nice to see a modern game that doesn’t hold its players’ hands, allowing them to get to grips with the controls in an organic and compelling way. It’s a bit of a shame that Getaway Shootout doesn’t come with a tutorial, because a game with controls this different probably needs one, even if it’s just a sandbox practice mode to get used to the movement. It’s not a deal-breaker, but it’s something to consider for the future. Getaway Shootout is a funny, vicious and oddly deep game. Its control scheme is fun to master, even if the enemy AI could be toned down a little in terms of difficulty, and a host of cosmetic unlockables plus a robust 2-player mode keep things interesting. If you’re looking for a friendship-ruiner that feels fun to play and keeps getting better as you get a better grasp on the controls, then Getaway Shootout is for you.